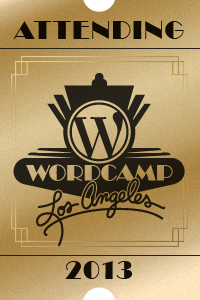 WordCamp LA 2013 – Free Ticket! *UPDATE – Turns out I had the contest settings a little wonky in setup – you don't have to go to facebook to “Like” the page. Simply click on the ticket below and you can enter directly. I have a free ticket for someone to ATTEND to WordCamp Los Angeles 2013. All you have to do is head over to the Facebook page, LIKE the page and enter. Thats all! Oh..did I mention that tickets are SOLD OUT!